3 boys in the house = a lot of LEGOS... everywhere. I step on them in the shower, lay on them in my bed, and pretty much spend a good portion of my day picking them up from every floor in the house. I don't complain, however, because I love LEGOS. They help my boys be creative with their play, and there's not much they would rather do on cold days in the house. 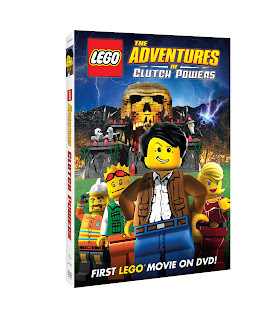 Universal Home Entertainment recently released the first LEGO full-length feature film for kids, The Adventures of Clutch Powers, and my skeptical Mom mind wondered if it would have any entertainment value. I couldn't have been more (pleasantly) surprised. I knew right away that this film had a lot of excitement -- (my boys kept saying "Mom! Listen to the music! It's like a grown-up movie, but it's OK for kids!") They loved the action sequences, the dialogue, and the Indiana-Jones type screenplay. It was the type of animated fun that can keep little boys engaged, but at the same time didn't drive me bonkers. The best part of the film was that it continued off screen. The boys kept building things that they saw in the movie with their LEGOS, and even with some of their off-brand building sets. They liked to draw pictures about the movie, and I could tell that it really sparked their imaginations. If this is the first of many movies to come, I'm really happy to see what's next! You can catch the trailer for this film at YouTube and find it at your favorite online video retailer! *I received a review copy from Universal Home Entertainment, and all opinions expressed are my own. I would Love to Win this for my Son, Following you on Twitter and I would Like to Know are you On Facebook as well? I've got two sons - 5 and 4 - who would LOVE this! I'd like to see this with my nephew Brendan. He loves Legos and constructing things. Our 3 Lego-lovin boys would love to see this movie! As I followed the link here from your tweet, our 8 year old was playing Lego Indiana Jones and our 4 year old was making Lego ships and boats! Our 12 year old was doing his homework at the moment but he has still builds Legos as often as he can. My 5 year old is a Legos fanatic and I think he'd really enjoy this dvd. I am the mom of 4 boys and now a grandma so the legos have come down from the attic--would love to win this flick! My son saw this and started begging me for it, so that is why I would like to win! I would love to win this for my grandson. He loves Legos and building things. Please count me in! I would love to catch this with my son! I would like to win this DVD for my daughter. We would watch it during our family movie night. My son is loopy fr all things legos,he'd love this. I would like to win this for my son's friend who is a huge Lego fan and has an upcoming birthday. I think my kids and I would have a fabulous time watching it together! I would love to win this because I bet it would inspire lots of creative play! My grandson would love this DVD, he loves playing with his Lego's. I would love to win this for my three little boys. They would all enjoy this so much. We recently had to cancel cable so we no longer have any TV and all they can watch now are DVD's so they would be so thrilled to watch something new. Thanks for the chance. We are a house obsessed with Legos. My husband has vowed that our children will have the same love for building with Legos as he has. Therefore, we buy a LOT of Legos, and they do love playing with them. The kids would love this movie. Thanks for doing a giveaway! I think this would be a great way to introduce my daughter to Legos! My nephew loves legos. I would love to win this for him. My daughter loves to build things!! Thanks for the chance. My son loves anything Lego and this is something we can watch together and not have to worry about the content in it. My son loves playing the lego style video games so I think he would enjoy the movie. My son would love to see this movie. Thanks for the giveaway. I would love to win this because my son is a huge Lego fanatic. My grandson plays with Legos all of the time. He would love this DVD! My son would think this was the coolest movie. Ever. I'm interested in seeing this movie because growing up my family were major lego fans. My 4 year old is quickly becoming as much (or more!) obsessessed with Legos than his big brother. This would definitely be for my wonderful grandson! Legos are big in our house too. I guarantee this DVD will be a huge hit. Thank you for the chance to win. My husband and kids are crazy for legos. My nephew absolutely loves LEGO, and he always have a blast when we play the video games together. My grandson love Legos and he would love this giveaway! My son and I love playing with Lego, it reminds me of when I was a kid. My son would love this, he's a huge lego fan. My kids, especially my twin seven year old boys, would love this!! My grandson loves Legos and he would love to see this. We are huge Lego fans and would love to see this! My son just loves legos. He plays with them all the time and he also plays all the lego Wii and XBox games. both my sons would love this! I think I might want to catch this flick because it sounds very interesting! I know my grandsons would enjoy this movie ... legos are the gift that keep on giving for years! I think my son would really enjoy this!